I remember eating a lot of okazu when I was little. 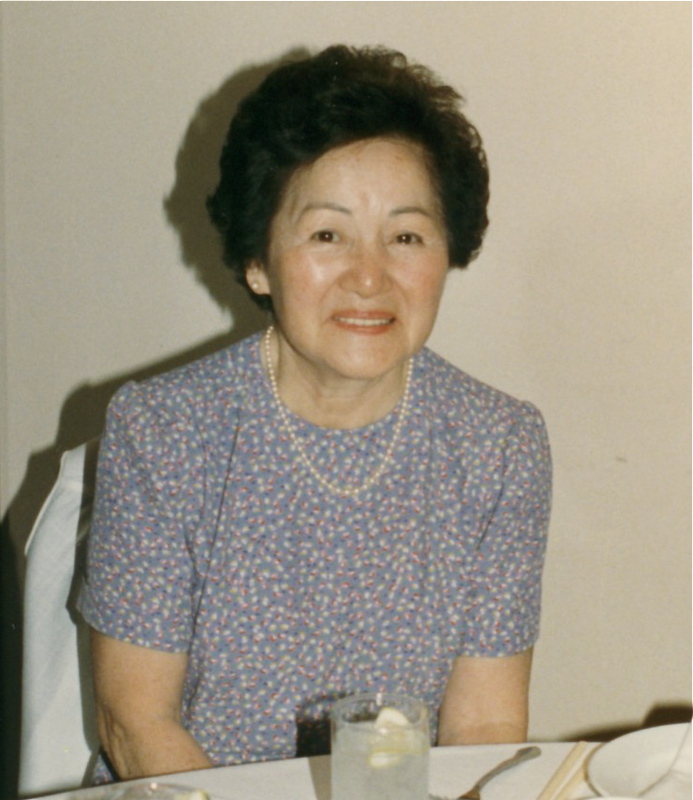 When my mother would make okazu, that meant a one-pot meal with lots of green vegetables, whatever was in season that my dad was growing, always served with rice. It was mostly vegetables, with just a little meat, and different every time. Mostly it would be made with ground meat, since that was the least expensive, and we had seven mouths to feed. Mom seasoned it with different things, but mostly shoyu and sugar. Okazu wasn't a favorite of mine when I was a kid, but it's a favorite of mine now. It's fast, easy & inexpensive. Today's okazu is made with pork, tofu, vegetables & black bean sauce. This is the meat I used. Thinly sliced pork loin on sale at Marukai. It's under one pound and costs only $3.11. It was plenty for 4 people. You can use any kind of meat, chicken or beef too. Use whatever you have on hand. If you buy the boneless pork chops at Costco, slice two of those thinly, and it will feed four. Isn't this head of napa cabbage pretty? That's how it should look, nice & green. Did you know that napa is the head of cabbage and nappa refers to the leaves? I didn't know that. The nappa will shrink, so the pieces can be a little bigger than what looks like bite-sized. I used about half of the bag of bean sprouts. Choose bean sprouts that don't have the dark part of the sprout on top. That means they're a little old. This is my tofu of choice, next to the fresh one. It comes in a block. Drain the water, cut in half, then cut each half into cubes. 16 cubes in each half. This is the black bean sauce I use. It has the garlic and ginger in it too. So easy. I used 3 tablespoons for this okazu. It's concentrated and will mellow out nicely when mixed in with the vegetables. Start by heating some oil in your wok or pan, about a tablespoon or two. When the oil is hot, add the meat and stir. 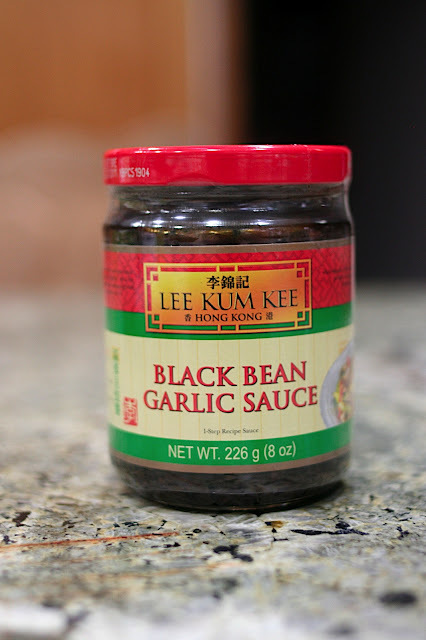 Add one tablespoon of the black bean sauce. Stir until the meat is no longer pink & coated with the black bean sauce. That keeps the meat from being overcooked. If you're not also cooking for a vegetarian, you can add a little oil to the pan before adding the onions, but since I'm cooking for a vegetarian, I gave the wok a quick rinse. 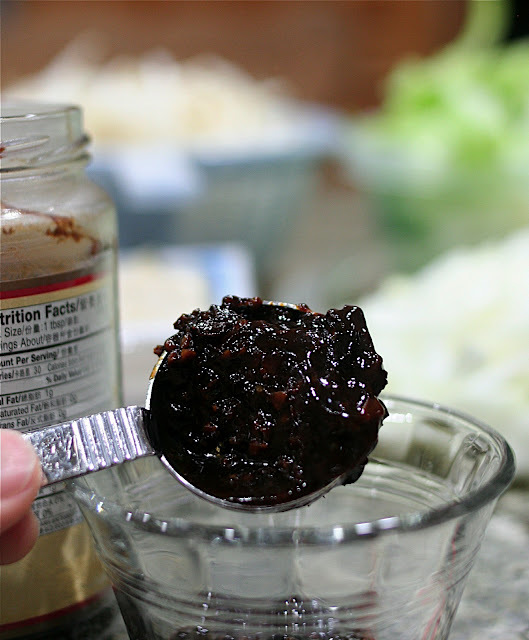 Add a tablespoon of the black bean sauce and stir in with the onions. 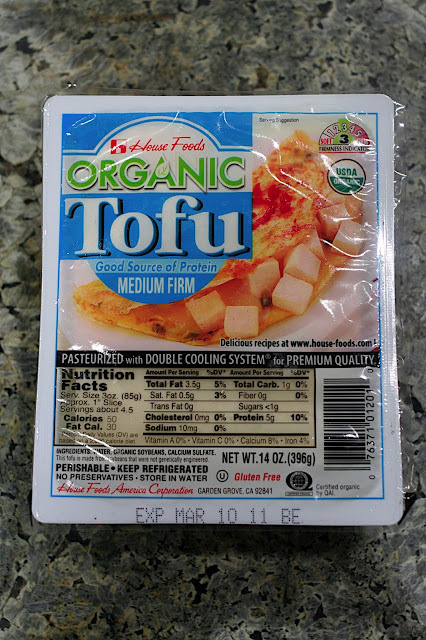 Then add the tofu and nappa. Adjust the seasoning, adding chili flakes or the last tablespoon of black bean sauce--that's what I did. Then, add the meat back in--or not--and serve with rice. Here's my lunch okazu of today. A meatless version of today's recipe, only I added some shingiku. That's a little red tsukemono--pickle--on the side. "That's our aunt. Grandpa's oldest sister." "No," I always say, "That's Auntie Kazu, okazu is food." Oh, this looks Chinese, too! Like a dish my mom makes, very similar. Delicious! !